One Family News on terror victims – read all about it! Terror victims news -the work of One Family is varied and every day is different . Here we showcase some recent events which One Family have been involved with together with a short description of a day at Summer Camp. As well as assisting victims of terror , some of our family of victims are using their experiences to help others who have been recently bereaved through terrorism. Renana Meir, the daughter of terror victim Dafna Meir, with her husband Or Cohen. Renana Meir, who witnessed the murder of her mother, Dafna, in January 2016 in a terror attack in their home, was married in a ceremony near Jerusalem recently. Her father, Natan Meir, remarried a few weeks earlier in a ceremony attended by close family in Jerusalem . In March 2017, a year after the terror attack in the West Bank settlement of Otniel, Meir announced that he was engaged. Dafna Meir, 38, a mother of four and foster mother of two young children, was stabbed to death in January 2016 at the entrance of her home by a teenage Palestinian attacker. She was fighting off her attacker in what is believed to have been an attempt to save three of her children who were in the house at the time. 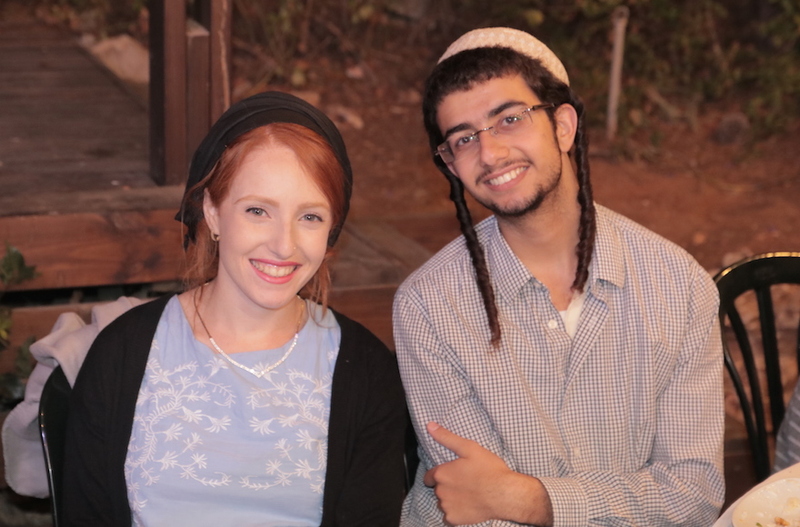 Renana Meir’s marriage to Or Cohen was celebrated at an sheva brachat hosted by One Family. The guests at the “sheva brachot,” included David Hatuel, whose four daughters and first wife, Tali, were murdered in a shooting terror attack in 2004, and Meir Pavlovsky of Kiryat Arba, who was badly wounded in a stabbing attack in Hebron a year and a half ago. Renana, who was 17 at the time of her mother’s murder, visited her mother’s grave the week before the wedding and placed an invitation to the wedding on it. She posted on social media a photo of the tombstone and the message, “We have put an invitation on your grave and I beg that you arrive. I leave one hand for you on the way to the chupah , please come to hold it.”Renana is a volunteer for One Family. From afar it looks like it could be any other summer camp for teens and children on their summer vacation. But in reality, this group, all wearing purple T-shirts, is one comprised of family members who have lost loved ones in terror attacks and wars. During the summer months, we holds outings for Israelis who have suffered first-hand the tragedies of terror and wars. “Whenever I would speak about my brother anywhere else people would just freeze. It was difficult for them to speak. Here the environment is easier. You can laugh about everything, speak about everything,” said Yitzhak Sarel, whose brother died during Operation Protective Edge in 2014. On the Monday for example, dozens of motorbikes were brought to the camp from the Israeli Motorcycle Club to a school where the youngsters are gathered. There, the youths were able to hop on the back and take a ride with one of the motorcyclists in the Golan Heights and the upper Galilee. “Anyone who knows the experience of riding on a motorbike knows how wonderful it is. It’s a feeling of freedom, space. To see the views from a slightly different angle without telephones. It allows them to demonstrate their presence and say to everyone ‘we are here,’” said Yaniv Yair, one of the riders who brought his stunning BMW bike for a spin. Yaniv’s brother was also killed after a Katyusha rocket landed near Kibbutz Kfar Giladi during the Second Lebanon War in 2006. “I think this shared fate makes them trust me more. Only someone who has been there knows and understands what it means,” Yaniv explained. Another one of the participants is Dvir, whose father Rabbi Yaakov Litman and brother Netanel were killed in a 2015 terror attack, also reflected on how it was to be with others who had shared experiences. Relatives of terror victims visit the families of murdered Druze police officers to offer their condolences and share their experiences. Among the visitors were Israelis who lost loved ones to terrorism. The visits were arranged by One Family as part of our role assisting bereaved families and victims of terrorism. Dozens of Israelis, Jews and non-Jews alike, answered the organisation’s call and bordered the buses to visit the families of Command Sergeant Major Hayil Satawi and Command Sergeant Major Kamil Shanaan. Among the visitors who paid their condolences to the families was Hadas Mizrachi, the widow of Baruch Mizrahi, a resident of Modi’in who was killed in a shooting attack two years ago while traveling with his family to celebrate the Passover Seder. “I recently visited the family of Hadas Malka, the policewoman who was murdered at the Damascus Gate … As a police widow, I see it as my mission to empower others, and if I managed to get up and continue going on with five children who experienced the attack themselves after my loss, that that is proof that you cannot give up. We were joined by tourists from the United States and England, together with the residents of Jerusalem, and Dvora Gonen, the mother of Danny, who was murdered in the attack two years ago, to embrace and share their sorrow and to express the deep connection between the Jewish people in the Diaspora and the Druze. We want to strengthen our alliance with the Druze and to turn this from a bloodbath into a covenant of life,” she added. In April 2016, a group of 31 bereaved siblings from the young adult division, embarked on a four day empowering journey to Salonika in Greece. “Using photography as a tool for therapy each participant was able to take a new perspective on what they see, to zoom in or out on any details they choose -life’s details”, said Meirav Uziel, the trip coordinator. This four-day empowering journey was specifically designed for young adults who have lost siblings or parents during the current wave of terror, or from wars or earlier terrorist attacks to create a brotherhood between the participants. The group consisted of “seniors” – those who experienced bereavement for some time, alongside “newcomers” who recently entered the world of bereavement. The combination helped newcomers see that life continues after the loss of a loved one, and it helps seniors recognize the progress they have made in their own bereavement process and to see if they are moving in the right direction. Avia Turjeman, aged 26 years old is married and a father of one child. Avia’s brother Evyatar z’l was killed in combat during Operation Protective Edge. Upon returning from this therapeutic trip, Avia explained that it was only by attending this shared empowering journey that he could face talking about his fears, especially how to keep the memory of his brother alive. The therapy takes place through the photography, the interactions between the participants, and the tours and attractions in a foreign city. During the trip, participants took part in daily sessions of therapeutic photography, and support circles. Avia said he felt an instant connection with the participants, especially during the support circles, because despite hardly knowing each other, “we just had to glance at the other and we immediately understand the depth of each other’s pain”. As part of the therapeutic process, photos that were taken during the day were processed as a group in the evening. The sharing that takes place provides mutual understanding and helps build tools that will help the youths at home, with their families, and in remembering the loved ones they lost. Ziv Helman, Director of bereaved alumni, said one of the group participants wrote to thank him, upon returning back to Israel. In his letter, he said: “Since I have returned home I have not stopped crying. It is so difficult to return to normal and back to reality. How can I even try to explain to other people what I went through on this journey? It feels impossible to describe the special relationship that the group experienced. The atmosphere was so unique; it was liberating and at the same time it provided a contained space where we understood each other, something that is deeply lacking in everyday life. I just want to say Thank You to One Family for helping me on this journey, a journey which I needed so deeply, yet before I went I did not realize how much. It provided me the air to breathe. I miss everyone so much and hope we will stay in touch! One Family understands the trauma of bereavement and injury from terror. Our family can provide the key elements that lead to successful rehabilitation. With this level of trauma, comes a feeling of isolation by singular experience. The perception of being alone affects every element of the recovery and rebuilding process. Our presence and resources ensure that victims and their families never need to feel alone. One of the primary ways in which One Family assists victims of terror is through emotional support provided through healing retreats, support groups, and therapeutic workshops for bereaved parents, parents of injured children, bereaved or injured young adults, widows and widowers, orphans, bereaved siblings, and wounded or maimed victims of all ages. Each healing retreat involves up to 200 people of similar experiences that later form into smaller, more localized support groups where victims continue to provide victim-to-victim support, learn from each other’s experiences, and give and receive comfort from each other. At One Family, we strive to overcome terror together. Through intensive and long-term therapeutic workshops (one-time) and support groups (meet weekly or monthly), terror victims are empowered to deal with their psychological and physical injuries on a daily basis. One Family holds periodic healing retreats for bereaved siblings, parents, widows and widowers, and wounded victims, allowing them to socialise with others in similar circumstances, make new friends, and escape the tension and sorrow that engulfs their lives. These retreats feature touring, therapeutic sessions, entertainment, and an opportunity to help the victims feel cared for both emotionally and spiritually. These retreats strengthen victims so that they can return to their homes and families with renewed energy to face their experiences, knowing that someone is there with them. The trip was also documented by Channel 10 Television and was broadcast as part of the Yom Hazikaron memorial shows.